Slap that mac 'n cheese right on your grill (or smoker) while you're simultaneously cooking hot dogs and watching your kids swim and you've got the ultimate in one stop shopping. It's too bad we can't move our beds next to our BBQs during the summer. That's how easy they makes our lives, right? No mess, no clean up. Anything you don't eat you toss (or give to your dog). And these days, I'll just about barbecue anything to see how it tastes. Peaches, corn, fish, green beans, sweet potatoes, asparagus, brussels sprouts -- hell, if it goes in your mouth you can put it on a grill. Well, sort of. 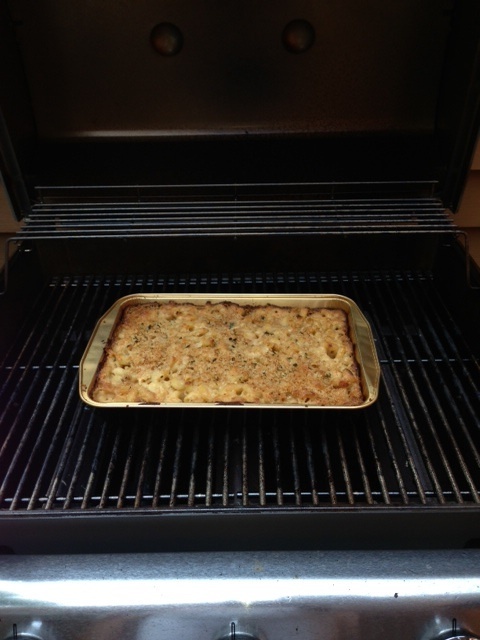 So when I was hunkering for a smoky mac 'n cheese, I thought, hey, why not?! Because it's (almost) summertime. And when the daily "I want mac 'n cheese" request hits promptly at 5 p.m., you won't see me standing next to a pot of boiling water. That's right. Slap that mac 'n cheese right on your grill (or smoker) while you're simultaneously cooking hot dogs and watching your kids swim and you've got the ultimate in one stop shopping. In a saucepan, saute green onions with butter. Whisk in milk, cheeses and spices. Add more milk if sauce gets too thick. In another pan, fry up that bacon! Now toss everything into a big tin pan or skillet. Make sure to grease it first! Sprinkle with Panko crumbs and cover. Grill (adding wood chips to your grill will give it the smoky flavor) for approximately 20 minutes or until cheese is bubbly.